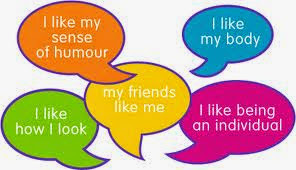 Self-Esteem -- What You Think About Yourself - Something New Everyday! Self-esteem can be defined as the way we feel about ourselves. In other words, it can be our self-concept that is reinforced by others evaluation about us. Our mind keeps on thinking all the time. A collision of ideas, thoughts and things occurs sometimes consciously as well as unconsciously. All the time, we convey unconscious self-appraisals of others and they respond to them accordingly. This is all about our self-esteem. It is one of the vital elements of character building. Many factors contribute in the formation of it but self-esteem acts like a protrusion where the other elements ascend or else descend. Thus, the character grows accordingly. At this stage, the two poles of character come to lime light which shows high self-esteem and low self-esteem. Now a cross comparison has been shown for further elaboration of them. As we know, success propagates success and failure begets failure. Our self concept is directly proportional to our productivity. People with high self-esteem always do constructive work. They optimize their productivity both in quality and quantity. On the other hand, people with low self-esteem laments over previous defeats. They present a heap of justifications for not being wrong. They slur upon others. In this way, they consume their productive hours viciously. A destructive pattern comes into being which shows their argue unnecessarily. They also start manifesting their stubborn nature which demonstrates their selves as self-conceited persons. So, it can be said that they are true followers of fatalistic approach. They take no initiatives. They just sit and wait for things to happen. They assume that everything is predestined and their efforts would be ended in smoke. The sole motto of their life looks busy and do nothing. As a result, they populate their hard ego. Their own negative thinking proofs that their prophecy is true. Whereas, people with high self-esteem are flexible in nature. It does not mean to have a massive ego in them. They irrigate their conscience with bare reality. They get ready to admit their flaws. They don’t defend their wrong doings by screaming at all. They build strong convictions silently. Moreover, they try hard to compensate. That's why they have a tendency to tolerate. As a result, their actions become the embodiment of a realistic approach. So, a constructive spectrum forms and it generates new avenues of optimism. Nevertheless, low self-esteem holders hanker after their idealistic world in which they soak their emotions into darkness. Their pessimism thrones at their hearts. Finally, they become victims of dejection. Melancholic and sardonic humor get circulated in their blood. They always bewail about themselves. They have not even least concern about others feelings. They are echoes of the words and become more touchy. There touchy attitude is signifying cactus approach. This is the reason they cannot develop good relationships. They are self-centered and invest loyalties to gain something. Actually, they want to take a leave from their responsibilities. They personify distracting tendency. On the opposite side, high self-esteem holders do not fall prey to disappointments. They rehabilitate and become more sensitive to other person needs. They value every acquaintance. They try hard to sustain them at any cost without personal motives. This thing is the progression of the caring and sensitive attitude. It is another aspect of their personality. They forge a post and burn like a midnight oil to establish their good will. They never compromise about their good character. But the others advertise themselves by bragging in order to gain cheap reputation. They are gossips mongers in true sense. When there is a real need to talk, they resist and feel themselves alone in the crowd. They are haunted by fears and loneliness becomes their fate. They may not know what they can do. This is the picture of lack of confidence that gives birth to insufficiency of motivation. They seek motivation from outside. Generally, an external source of motivation is inconsistent. Such people fed up from their routines. That's why the persistency and consistency evaporate from their nature. Unlikely, other people have reserve personality. They seem to prefer being alone. They value their time and make it more valuable by fruitful discussions. They are blessed with the latent capacity to defend their own words. It becomes the permanent part of their nature. They manifest consistency. They are internally driven that consolidates their confidence level. They set the trends and formulate their own standards. They are more prone to challenges. They take them as an adventure. Thus, they act according to a systematic strategy. The depth of their determination depends upon the swiftness of their progress. They opt the formula to Do or Die. They have extrinsic quality to receive both appreciation and criticism. They have molded their characters. This feedback accelerates their rate of assertiveness. On the contrary, the low self-esteem holders take challenges as a new hurdle. They are premised that it is their unalterable fate. They never think that every lock has a key. They have no faith in commitments. Their lives revolve around probabilities. They always expect appreciation over their ridiculous actions even. They cannot digest criticism and have cynical approach. This adds aggression that ends in worse results. They nominate themselves rebels having fragile ego. In a nutshell, every man draws some boundaries for different things. He can’t grow beyond the boundaries of self-concept. It is always up to his ability of self-analysis. If he thinks he is positive, everything seems to be hailing. If he thinks he is negative, nature seems to be against him. It is very simple because the more you extend your border, the more your vision will be broaden. an is one of the biggest blessings of Allah for any Pakistani. Whatever we have today it’s all because of Pakistan, otherwise, we would have nothing. Please be sincere to Pakistan.